How much does it cost to travel to Levi? How much money will you need in Levi? €101 ($114) is the average daily price for traveling in Levi. The average price of food for one day is €27 ($30). The average price of a hotel for a couple is €98 ($111). Additional pricing is in the table below. These average travel prices have been collected from other travelers to help you plan your own travel budget. Levi is a micro city or resort town in the village if Sirkka in Finnish Lapland. In Levi, being impressed by the natural surroundings is inescapable: from river valleys and frozen lakes up to the fells with spectacular views over the Lappish landscape, Levi is all about northern nature at its best. During the winter months, from mid-November to mid-May, Levi is Finland's most popular ski resort with a total of 44 runs serviced by 28 lifts. Its Samiland Exhibition explores the culture of the indigenous Sami people through photos, objects and recreated buildings. Nearby is Pallas-Yllastunturi National Park, with its Arctic fells and remains of the Linkupalo Volcano. The breath-taking nature of Levi is an experience in itself. It nurtures the mind and soul during all seasons around the year. 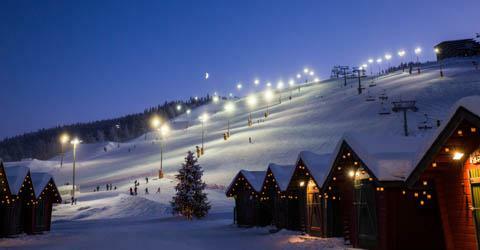 The natural beauty is the top sight in Levi and it is a place where you can enjoy and breath the purest air in Europe. Experience the magical Northern Lights in the Levi sky. The Aurora is an unpredictable, natural event, which occurs all year round. Come on a night safari or stand on an open space to witness these phenomena. Levi is a resort town, and everything you need is in the center which is compact and colorful with a variety of shops and restaurants. It's almost North American in appearance, and its colored and brightly-lit wooden cabin buildings always give off a welcoming and inviting air, particularly to families. In such cold conditions, this, and the warmth of the native Lappish people comes as warm relief. There's not much in the way of apres-ski but you can keep dancing into the small hours should you wish to. Because Levi is primarily a ski resort town, skiing is among the top and favorite activities in the small town. There are several slopes ranging from beginner to experienced and several are lighted for continued fun later in the night, or early on a winter day. As one of Finland's most famous resorts, Levi also hosts World Cup ski events every year - a measure of the quality of some of the skiing here. Levi's variety of services including bars, restaurants, shops, a spa and child friendly activities are conveniently situated in the compact heart of the center, all within walking distance from most of the hotels. The surrounding wilderness boasts spectacular scenery, and is a haven for truly exotic Lappish adventures in snowy conditions. Snowmobile safaris, snowshoe and cross country skiing trips in the beautiful fell scenery is one of the highlights of the area. Reindeer safaris in age old landscapes, and dog sled safaris in charge of your own team of dogs are a perfect way to experience the pure natural surroundings. The traditional Lappish culture can also be conveniently found at the Samiland exhibition on the Levi fell, and the spectacular Snow Village - the largest snow structure of its kind in Europe is only a short 40 minutes transfer away. For those wishing to unwind, a spa with beauty treatments and well-being services is right in the center of Levi. After an eventful day, Levi's famous nightlife with some 40 restaurants caters for all tastes in terms of drinks and food. Local restaurants offer good variety of local delicacies. Especially worth of trying are reindeer (poro) in all its forms, willow grouse (riekko) and several fish such as salmon (lohi) arctic char (nieria) and common whitefish (siika). These are usually fried or smoked and eaten with mashed potatoes. In addition to local specialties also , pizzas and kebabs are available. For a couple of restaurant ideas, try: Teepee restaurant, a cozy restaurant with delicious Lappish food and Crazy Reindeer (Hullu Poro Oy), for some reindeer cuisine. The closest airport is the Kittila airport, which is less than a half an hour's transfer from Levi. The Kittila airport is not huge, but does get a decent amount of traffic with regular flights to and from places like London, Paris, and other European airports. The flight is about three and a half hours from London. An airport bus operates from Kittila airport to Levi after every Finnair flight all year round. Departure is after the baggage reclaim. The airport bus operates also from Levi to the airport before the flights. By train you can travel to Kolari or Rovaniemi and from there by bus to Levi. The distance between Kolari and Levi is 80 km and between Rovaniemi and Levi 170 km. Both have a bus connection departing after the arrival of the train. Levi has internal bus traffic. In the Levi center you may easily walk or ski around. For longer trips to the forests, it's best to hire a car or take a tour.